The CRTPO has begun the next stage of developing future transportation projects for Iredell, Mecklenburg, and Union Counties and is requesting resident input on potential transportation priorities. The CRTPO works closely with the North Carolina Department of Transportation (NCDOT) to develop the 2020-2029 Transportation Improvement Program in a process known as Prioritization 5.0. 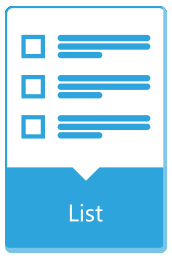 Prioritization is NCDOT’s decision making tool for developing the Transportation Improvement Program (TIP), which is a listing of projects to be delivered within an upcoming ten-year work program. The current round is known as Prioritization 5.0 (or P5.0), and will develop the 2020-2029 TIP. CRTPO is involved in the nomination of projects for scoring by NCDOT, and the application of local input points based upon its methodology. The NCDOT-Strategic Prioritization Office of Transportation (SPOT) leads this process by providing oversight to MPOs, RPOs and Divisions throughout the state as well as scoring the projects. Local Input Points from MPOs and NCDOT Divisions contribute to the final project scores for Regional Impact and Division Needs tier projects under P5.0 – (see STI legislation for more details). Projects with higher final scores have a greater chance of being programmed into the TIP based upon the STI legislation. Projects of all modes, including highway, bicycle/pedestrian, transit, and others are scored based on a combination of quantitative data and local input. The quantitative evaluation consists of criteria such as congestion and safety, and analyzing project benefits compared to cost, as well as expected economic impacts. Local input comes from the priorities of the local Metropolitan Planning Organizations (MPOs) and NCDOT Division Offices. Public Involvement is an important part of the NCDOT Prioritization 5.0 process to develop the 2020-2029 STIP. Public Engagement occurs during the project selection process, and during the Regional Impact and Division Needs local input point assignment phases. A 14-day public comment period was held between September 20, 2018 and Thursday, October 4, 2018 for the projects recommended for the CRTPO’s Division Needs local input points within the 2020-2029 TIP Development process (NCDOT Prioritization 5.0). The media release can be viewed here. Members of the public can also comment on the proposed project lists during the CRTPO Board meeting on Wednesday, October 17. The CRTPO Board meeting will be held in Room 267 of the Charlotte-Mecklenburg Government Center beginning at 6 p.m. Those who wish to speak must sign up at least five minutes prior to the start of the meeting. A 30-day public comment period began on Monday May 21, 2018 and concluded on Wednesday June 20, 2018 for transportation projects recommended for Regional Impact local input point assignment under NCDOT Prioritization 5.0. The media release can be viewed here. Regional Impact highway projects consist of U.S. and North Carolina routes (i.e. US 521, NC 16, NC 49), regional transit aviation, and rail projects. The CRTPO received 201 public comments during the public comment period. A summary of public comments received during the public comment period can be viewed here. The June 20, 2018 CRTPO meeting served as an opportunity for public comment on the projects proposed for Regional Impact local input point assignment in P5.0. All MPOs and NCDOT Divisions must assign their Regional Impact points to projects by July 27, 2018. Local Input Points define up to 30% of the quantitative scores for Regional Impact projects under NCDOT Prioritization 5.0. A separate local input point assignment public comment window will begin in September for Division Needs projects. It is important that residents provide input in during the project submittal phase within the TIP development process because the STI legislation limits project submission to MPOs, RPOs, or NCDOT Divisions. This requires residents, local governments, and other public interest groups to actively participate in the CRTPO’s public involvement period of its project submission phase to ensure that their priorities are being considered within this process. A public comment period was held from August 17, 2017 until August 31,2017 on the projects of all transportation modes that were proposed for submission for NCDOT Prioritization 5.0. A summary of public comments received can be viewed here. The public comments were presented as part of the CRTPO board approval of the project lists during the September 20, 2017 MPO meeting. 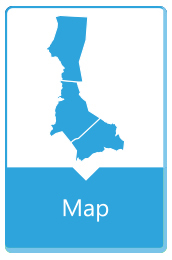 Quantitative scores, maps, and local input point assignments can be viewed for CRTPO’s P5.0 projects below. On April 3, 2018 NCDOT released the P5.0 Quantitative Scores for all projects and a list of the funded Statewide Mobility Projects. 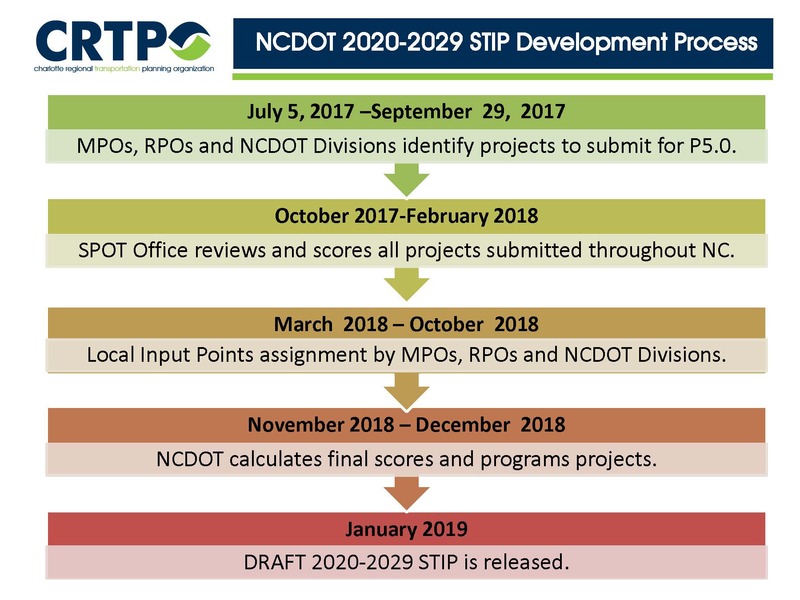 The STI legislation requires that MPOs in North Carolina must develop an adopt a methodology for assigning its local input points as part of the NCDOT Prioritization process. The methodology must contain two criteria (one must be qualitative) for determining project prioritization. In addition, the methodology must contain a public engagement strategy during the local input points process that is consistent with the MPO’s Public Involvement Plan. The CRTPO’s adopted Local Input Points Methodology for NCDOT Prioritization 5.0 can be viewed here. Passed in 2013, the Strategic Transportation Investments law allows the NCDOT to use its funding more efficiently and effectively to enhance the state's infrastructure, while supporting economic growth, job creation and a higher quality of life. This process encourages thinking from a statewide and regional perspective while also providing flexibility to address local needs. STI also establishes the Strategic Mobility Formula, which allocates available revenues based on data-driven scoring and local input. It is used to develop NCDOT's State Transportation Improvement Program, which identifies the transportation projects that will receive funding during a specified 10-year period.